Evolution of software has long been recognized as one of the most problematic and challenging areas in the field of software engineering, as evidenced by the high, often up to 60-80%, life-cycle costs attributed to this activity over the life of a software system. Studies of software evolution are central to the understanding and practice of software development. Yet it has received relatively little attention in the field of software engineering. This book focuses on topics aimed at giving a scientific insight into the aspect of software evolution and feedback. In summary, the book covers conceptual, phenomenological, empirical, technological and theoretical aspects of the field of software evolution - with contributions from the leading experts. This book delivers an up-to-date scientific understanding of what software evolution is, to show why it is inevitable for real world applications, and it demonstrates the role of feedback in software development and maintenance. The book also addresses some of the phenomenological and technological underpinnings and includes rules and guidelines for increased software evolvability and, in general, sustainability of the evolution process. 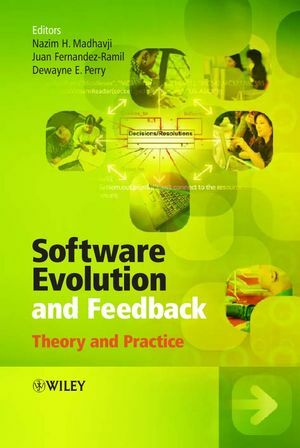 Software Evolution and Feedback provides a long overdue, scientific focus on software evolution and the role of feedback in the software process, making this the indispensable guide for all software practitioners, researchers and managers in the software industry. Nazim H. Madhavji and Juan Fernandez-Ramil are the authors of Software Evolution and Feedback: Theory and Practice, published by Wiley. 1 Software Evolution (Meir Lehman and Juan Fernandez Ramil). 2 A Nontraditional View of the Dimensions of Software Evolution (Dewayne E. Perry). A Complexity Perspective (Eve Mitleton-Kelly). 4 Facets of Software Evolution (Roland T. Mittermeir). 5 Evolution in Software Systems: Foundations of the SPE Classification Scheme )Stephen Cook, Rachel Harrison, Meir M. Lehman and Paul Wernick). 6 A Simple Model of Software System Evolutionary Growth (Władysław M. Turski). 7 Statistical Modelling of Software Evolution Processes (Tetsuo Tamai and Takako Nakatani). 8 A Case Study of Software Requirements Changes Due to External Factors (Vic Nanda and Nazim H. Madhavji). 9 Understanding Open-Source Software Evolution (Walt Scacchi). 10 Structural Analysis of Open Source Systems (Andrea Capiluppi, Maurizio Morisio and Juan Fernandez-Ramil). 11 A Study of Software Evolution at Different Levels of Granularity (Elizabeth Burd). 12 The Role of Ripple Effect in Software Evolution (Sue Black). 13 The Impact of Software-Architecture Compliance on System Evolution (R. Mark Greenwood, Ken Mayes, Wykeen Seet, Brian C. Warboys, Dharini Balasubramaniam, Graham Kirby, Ron Morrison and Aled Sage). 14 Comparison of Three Evaluation Methods for Object-Oriented Framework Evolution (Michael Mattsson). 15 Formal Perspectives on Software Evolution: from Refinement to Retrenchment (Michael Poppleton and Lindsay Groves). 16 Background and Approach to Development of a Theory of Software Evolution (Meir M Lehman and Juan Fern´andez Ramil). 17 Difficulties with Feedback Control in Software Processes (Meir M. Lehman, Dewayne E. Perry and Wlad Turski). 18 Policy-Guided Software Evolution (Nazim H. Madhavji and Josee Tasse). 19 Feedback in Requirements Discovery and Specification: a Quality Gateway for Testing Requirements (Suzanne Robertson). 20 Requirements Risk and Software Reliability (Norman F. Schneidewind). 21 Combining Process Feedback with Discrete Event Simulation Models to Support Software Project Management (David Raffo and Joseph Vandeville). 22 A Feedforward Capability to Improve Software Reestimation (William W. Agresti). 23 Modelling the Feedback Part of the Software Process in Software Resource Estimation (Juan Fernandez-Ramil and Sarah Beecham). 24 Value-Based Feedback in Software and Information Systems Development (Barry Boehm and LiGuo Huang). 25 Expert Estimation of Software Development Cost: Learning through Feedback (Magne Jørgensen and Dag Sjøberg). 26 Self-Adaptive Software: Internalized Feedback (Robert Laddaga, Paul Robertson and Howard Shrobe). 27 Rules and Tools for Software Evolution Planning and Management (Meir M (Manny) Lehman and Juan Fernandez Ramil).